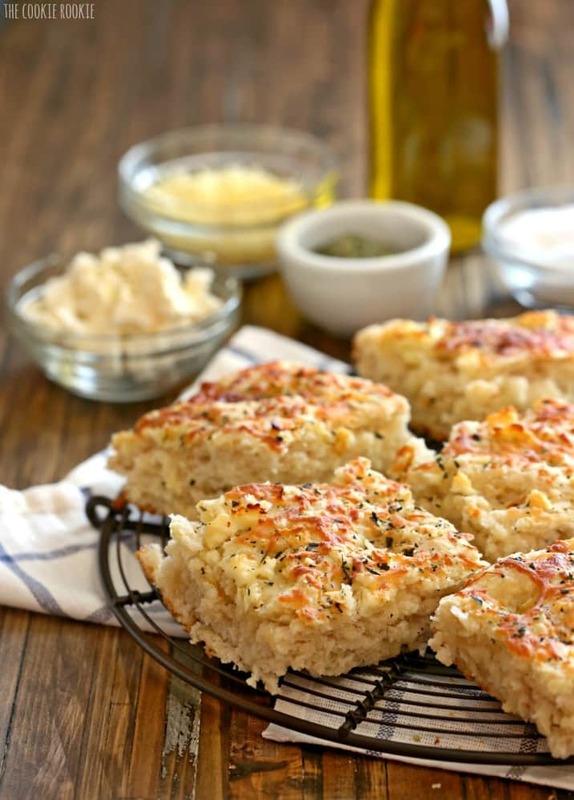 This EASY Three Cheese Focaccia is the perfect bread for any beginner baker! (LIKE ME!) 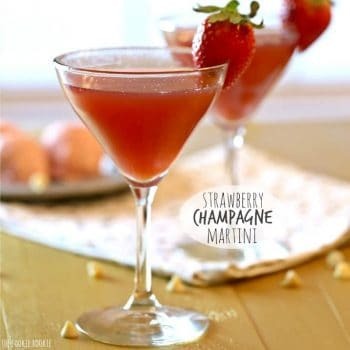 Delicious, impressive, and super simple! Anyone can make homemade bread. If I can do it, you can do it! I may not have contributed much food-wise to Christmas in Kirksville (can you blame me??? ), but I did MAKE BREAD!!!! If that doesn’t shock you, it should. I have only made two cakes in my life, and have never made bread. Baking is coming to me slowly but surely. I have always been scared to try it. Why was I so scared?? 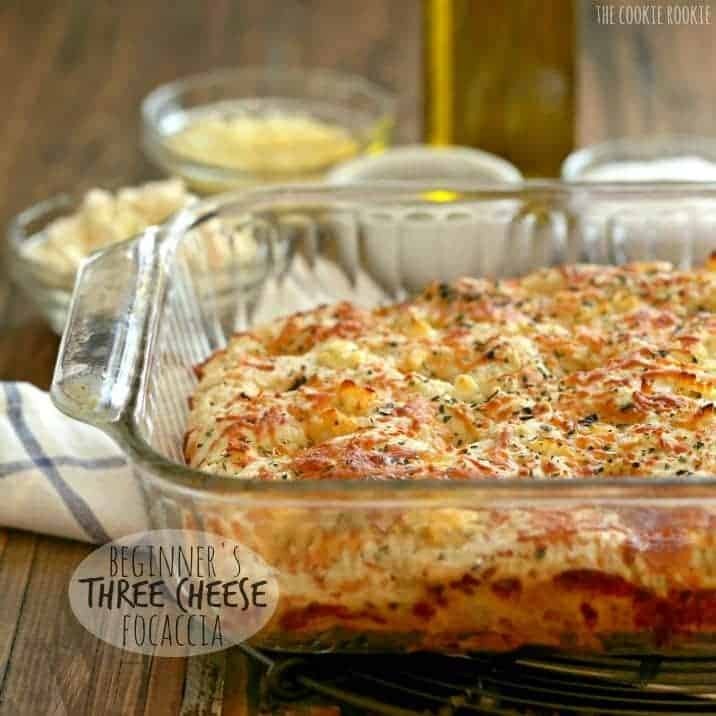 Is it possible that this delicious Beginner’s Three Cheese Focaccia was both easy and delicious?? Not intimidating at all? Quick? Yes. All of those things are possible. I know, I was shocked too. 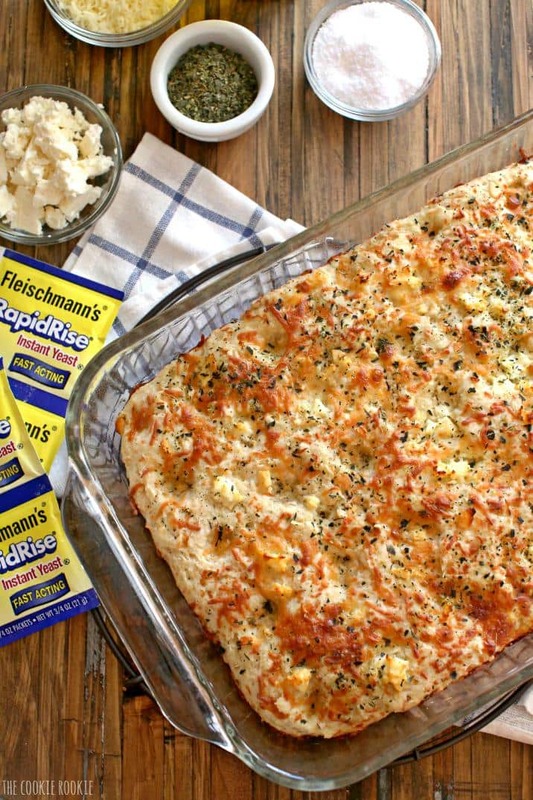 When I first was given Fleischmann’s® RapidRise® Yeast…I wasn’t sure what to think. My sister-in-law is a MASTER baker, and I’ve watched her test the yeast, slave over the perfect pie crust or cinnamon rolls, wait forever for yeast to rise. 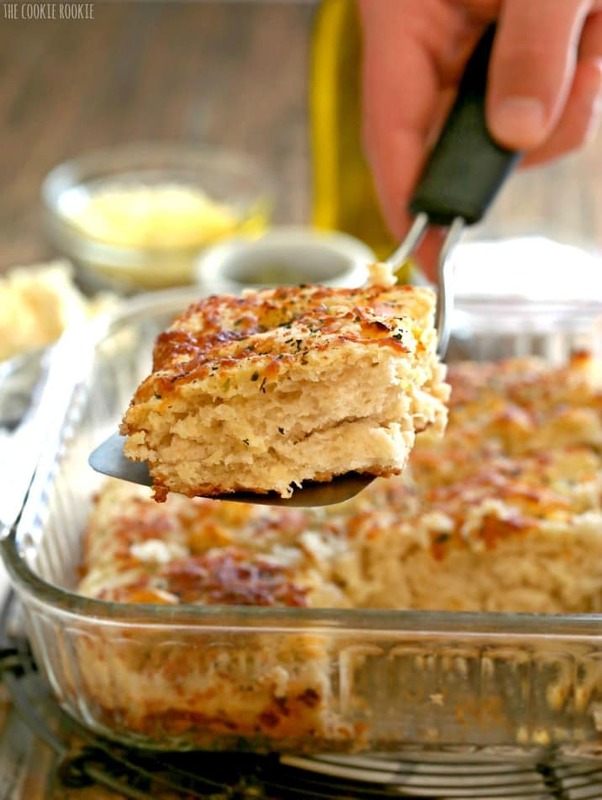 I didn’t believe that the process for this Three Cheese Focaccia could be quick and easy. To be honest, that’s what kept me away from bread making. The time. I’m into easy, not complicated. I was SO pleasantly surprised by this RapidRise yeast. It was as easy as the package said. No testing required. You can mix it right in with your dry ingredients. It worked like a charm. I was filled with pride! 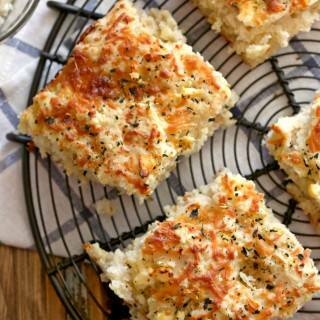 Look at that tasty, crusty, Three Cheese Focaccia! I made that!! Let’s break down the steps so you can see just how easy this delicious bread can be. 3) Allow the dough to rise in a warm place. We placed our oven on 200F for 2-3 minutes and then turned it off 5 minutes before placing the bread inside to rise. Easy, right?? I know. I’m shocked too. I saved this recipe to make with my mom over Christmas weekend (because I was scared to make it alone). I really shouldn’t have been scared. Take the leap, it’s SO easy! I can’t wait to try more recipes for beginners, and maybe eventually even step it up to harder recipes! (NOT YET) You can find lots of fool-proof delicious recipes on Bread World HERE. 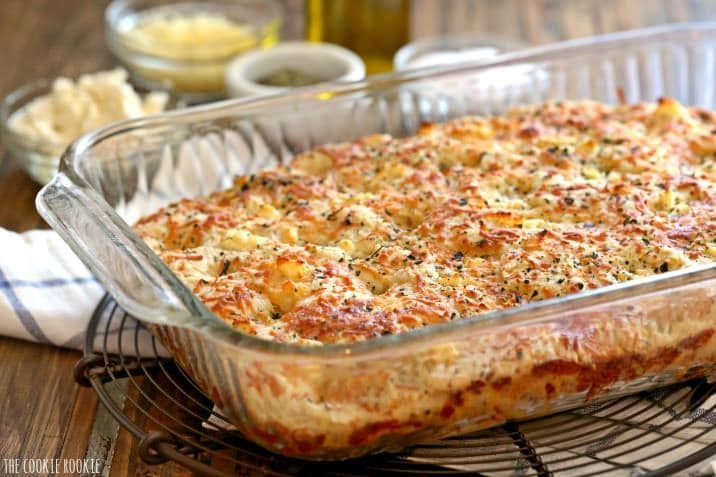 I modified their Beginner’s Focaccia by adding lots of cheese (duh.) Can’t go wrong there! Such an easy and delicious homemade bread that anyone can make! Combine flour, dry yeast, sugar and salt in a large mixing bowl and stir until blended. Combine water and 2 tablespoons olive oil in a microwave-safe bowl. Microwave on HIGH in 15 second increments until very warm but not scalding hot to the touch (120° to 130°F). Add water mixture to flour mixture. Stir with a large wooden spoon until well mixed. A dough will form. Spread into greased 13 x 9-inch pan . The dough might not completely go to corners, but it will once it rises. Cover with thin kitchen towel; let rise in warm place until doubled in size, about 30 minutes . Using your lightly oiled finger, gently poke holes about every inch in the dough going nearly to the bottom of the dough. Drizzle with remaining 2 tablespoons olive oil. Sprinkle top with more cheese, sea salt, and Italian herbs. Let rise, uncovered, an additional 15 minutes while oven preheats to 375°F. Bake for 30-35 minutes or until golden brown. Cool slightly. Cut and serve with extra oil for dipping if you'd like. Thank you for each one of your sweet comments. Dad and I are still reeling about Harper, aka: The Stealth Bandit, serving herself three helpings of the most tender steak that ever graced our table. 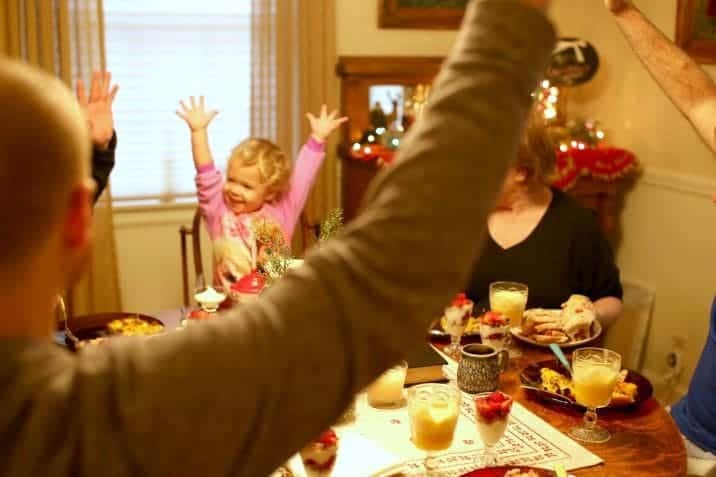 Oh well, it was Christmas for her too. By the way, she also helped herself to the leftover focaccia before dad and I could get another bite. Thanks for stopping by Allie! I LOVE your blog/photos. Happy New Year! 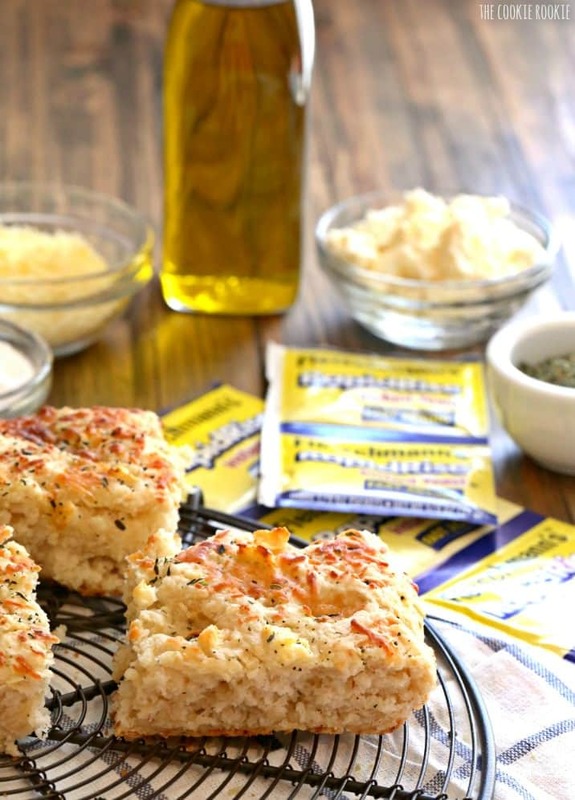 I love to bake and in all my baking over the years, I’ve never made focaccia! Yours looks amazing, those colors, I need to make this soon! I LOVE your blog Jo! Thanks for stopping by! 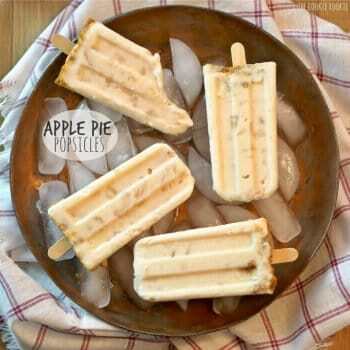 Thank you for the recipe it looks delicious. I am in the process of making it but I just have one question; do I mix cheese with the dough? because in step 6 you instructed to add more cheese and I thought we might have needed to add before that. 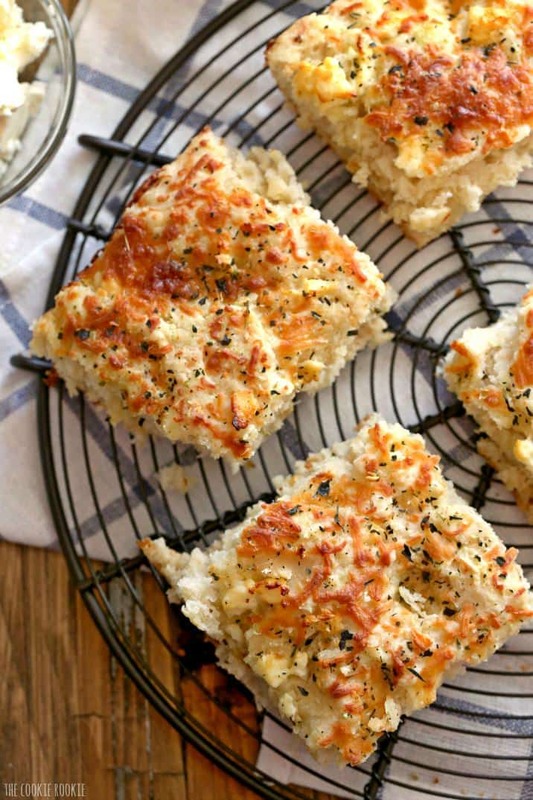 I visited your page to get a recipe for easy cheese focaccia and was shockedto see mention of my hometown and birth place Kirksville. How Cool! I have got to make this bread now! Oh wow! I grew up there too. Small world! !